Faraway Press: The Online Home of John Jackson Miller: Knight Errant - Escape #2 hits shelves Wednesday! 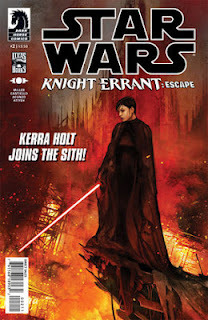 I'm in the middle of my own Escape to San Diego as this is posted — but you can find an escape of your own in your comics shop on Wednesday with Star Wars: Knight Errant - Escape #2! Kerra's journey into Sith space continues, and we see a lot more about her personal history — and how it's been tied together with Odion's destiny from the beginning. The issue will also be on sale from TFAW and from vendors in San Diego, where I will be signing every day — here's the schedule — and they'll also have the variant San Diego edition of #1 there, as well. Covers for Knight Errant - Escape #5 and Lost Tribe of the Sith #3 also are now online — and my interview with Jedi News has just been posted. First one there in six years! And IO9 has news about Brian Wood's new Star Wars series, just announced.